Qi'a Cereal is a convenient way to add additional nutrition and crunch to yogurt, grains, soups, and a variety of other foods. It's made from 3 simple ingredients that are all whole foods. It contains no natural flavors or other additives that make it less healthy. Based on our experience, its ingredients have always tasted fresh and appear to be from quality sources. All ingredients are listed as organic. It's a very convenient way to add nutrition to a variety of foods. It's a very convenient way to add a crunchy texture to a variety of foods. It's a good source of fiber with 4g (16% DV) of fiber. It's often more expensive than seed mixes that contain more widely distributed seeds like sunflower seeds. It may also be more cost-effective to purchase each type of seed in bulk. It's produced in a facility that uses soy, peanuts, milk, and tree nuts, which might matter if you're allergic to any of those. It likely won't taste as good by itself as products that have flavor enhancers or added sodium. This is just our review. % Daily Values are based on a 2,000-calorie diet for healthy adults. CHIA SEEDS*, BUCKWHEAT GROATS*, HEMP SEEDS*. We believe Nature's Path Qi'a Cereal is healthy because it contains 3 simple, nutritious whole food ingredients with no additives or other flavors. No. Qi'a Cereal does contain genetically modified ingredients. Their marketing materials explicitly state that Qi'a Cereal is non-GMO. Yes. Qi'a Cereal is organic. According to their Our Path page, all Nature's Path products are organic. In fact, Nature’s Path products were the first USDA certified organic cereals. Is Nature's Path Qi'a Chia, Buckwheat & Hemp Cereal vegan-friendly? Yes. Nature's Path Qi'a Chia, Buckwheat & Hemp Cereal is vegan-friendly. All 3 ingredients are vegan-friendly. Is Nature's Path Qi'a Chia, Buckwheat & Hemp Cereal gluten-free? Yes. Nature's Path Qi'a Chia, Buckwheat & Hemp Cereal is gluten-free. All 3 ingredients are gluten-free. Is Nature's Path Qi'a Chia, Buckwheat & Hemp Cereal dairy-free? Yes. Nature's Path Qi'a Chia, Buckwheat & Hemp Cereal is dairy-free. All 3 ingredients are dairy-free. 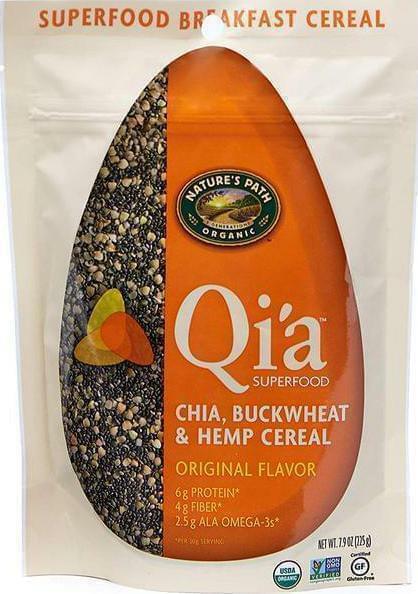 Is Nature's Path Qi'a Chia, Buckwheat & Hemp Cereal keto friendly? No. Nature's Path Qi'a Chia, Buckwheat & Hemp Cereal is not keto friendly because it contains buckwheat groats. Is Nature's Path Qi'a Chia, Buckwheat & Hemp Cereal lactose-free? Yes. Nature's Path Qi'a Chia, Buckwheat & Hemp Cereal is lactose-free. All 3 ingredients are lactose-free. Is Nature's Path Qi'a Chia, Buckwheat & Hemp Cereal paleo? Yes. Nature's Path Qi'a Chia, Buckwheat & Hemp Cereal is paleo. All 3 ingredients are paleo. Where can I buy Qi'a Cereal? Qi'a Cereal is available on Amazon, Walmart, Target. Nature's Path Qi'a Chia, Buckwheat & Hemp Cereal is made by Nature's Path. As an Amazon Associate Different Diet earns from qualifying purchases.